Howard’s sixth consecutive win over Morehouse extends the overall series record to 23-10-2. Photo courtesy of The Hilltop. For the third consecutive year, Howard (1-1) defeated Morehouse (0-1) in the AT&T Nation’s Football Classic at RFK Stadium last Saturday. While the final score of the previous two match-ups were separated by just four points, Howard took control early and seized a 27-16 victory before a crowd of 17,012 people. Quarterback Greg McGhee received his second AT&T Nation’s Football Classic MVP after going 21-of-27 for 242 yards and three touchdowns. Along with the exceptional quarterback play was a defense that recorded 9 sacks, an interception and 14 tackles for a loss. After a first quarter of one field goal by each team, Howard’s first play of the second quarter was a 20-yard touchdown pass from McGhee to freshman running back Anthony Philyaw in the corner of the end-zone, extending the lead to 10-3. Aiyegoro and a 31-yard pass to senior wideout Brandon Flanagan. The team capped off the drive with a 33-yard field goal by John Fleck, giving the Bison a double-digit, 13-3 lead. “We tried to get back to the ball as fast as possible and catch [Morehouse] in coverages that we wanted,” said McGhee, who believes the fast-paced style of offense was instrumental to the team’s success Saturday. “We beat a lot of teams with our tempo. That’s what all our conditioning is for after practice,” continued the junior Pittsburgh native. 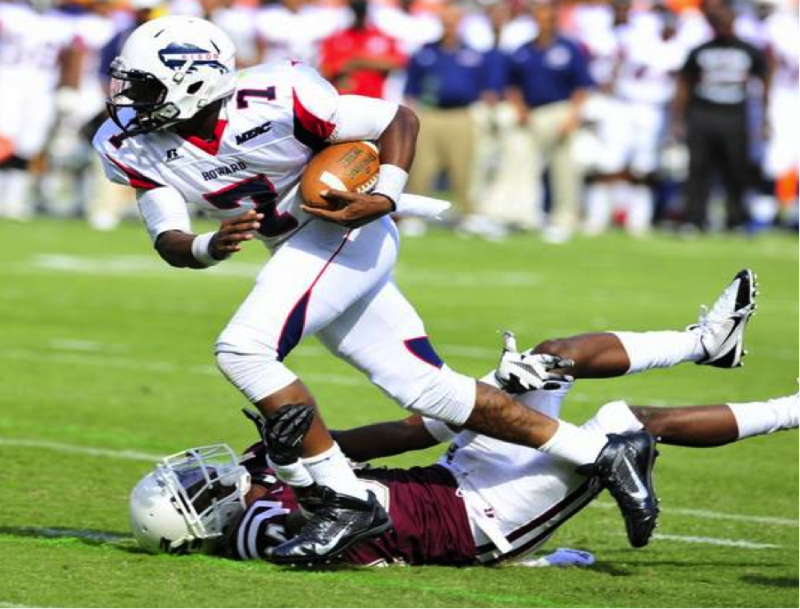 McGhee and offensive coordinator Ted White were able to run a successful hurry-up offense as Howard’s time of possession was 24:54 compared to Morehouse’s 35:06. With less than two minutes in the first half, Howard extended its lead to 20-3 off a 27-yard strike from McGhee to sophomore wide receiver Matthew Colvin. Colvin finished the game with 3 receptions for 57 yards to go along with the touchdown. The Maroon Tigers attempted to score before the end of the half but Howard’s staunch defense continued to plague Morehouse’s offense, ending the half with a sack by defensive end Marques Blanchard. “It was just relentless effort and discipline defense,” said senior linebacker Tabrian Resby, who finished the game with nine tackles and two sacks. The pressure on the quarterback was effective throughout the game as the Morehouse backfield was replete with Bison. The defensive effort from the front seven and the secondary was communal as Harris was held to just one pass for more than 15 yards. “Good job by the secondary to hold tight so the pressure could be a factor,” Resby continued. Morehouse received to start the second half but was still ineffective as the defense forced a three-and-out. Midway through the third quarter, McGhee completed a 26-yard pass to junior wide receiver Rodney “DJ” Tyson, imposing a 27-3 lead. With 49 seconds remaining in the third quarter, Morehouse scored the team’s first touchdown of the game on a nine-yard pass from Harris to Brandon Sartin, trimming the deficit to 27-9 due to a missed extra point. After a Howard punt, the Maroon Tigers capped off a 90-yard drive with a touchdown run for three yards by running back Shelton Hamilton. The score reduced the deficit to an 11-point game, as Howard led 27-16 with 10:06 remaining in regulation. Howard gave up an 11-point lead in the second half last week against Eastern Michigan, but the defense was able to sustain Morehouse’s momentum as well as any late-game heroics. The Howard victory was the sixth consecutive win over Morehouse, extending the overall series record to 23-10-2. Khari Arnold is sports editor of The Hilltop at Howard University.